My husband and I started potty training our daughter a few weeks before her second birthday. I had been looking forward to getting her out of diapers for a long time. I was so over the wrestling matches that happened several times a day, trying to pin her down for a quick change. She was usually in tears, and I was exhausted. And I knew that my daughter is one smart cookie and would get the hang of it. It was hard. It still is, even though she is 90% accident free. Potty training for us has been a complete roller coaster of emotions. I was calm and collected for the first six days. My daughter seemed to be getting it. But then on day seven, it was as if she had forgotten everything. It was a temporary regression, which is, according to the book, completely normal. Things got better. And then they got worse. And then better. And then worse. Those ups and downs have spaced themselves out considerably now, but I remember being so completely bewildered by these turns of events. Seriously, I thought, we have been doing this for WEEKS (or MONTHS); why can we not be accident-free already? About a month ago, my daughter woke up from a nap in her big-girl bed completely soaked with pee. It was if she had just taken a bath. This happened during one of those low moments of cluster accidents. I calmly took off her dress and wrapped a towel around her, leaving the room to fetch her post-nap cup of milk. I took the cap off the lid of the milk jug and proceeded to pour the milk into the sippy cup. And then, I noticed that I spilled a few drops of milk on the counter. I caught my breath, my eyes widening a little bit and tears coming to my eyes. I put the lid back on the milk, put the jug back in the fridge and got a towel to wipe up my mess. This was my a-ha moment. I have been pouring liquids for almost 30 years now, and I am still having accidents. I am not perfect. How in the world can I expect someone who has only been alive for two years to be perfect at going potty or poop in the toilet? I brought my daughter her milk and gave her a huge hug, fighting back the tears. I couldn’t believe how hard I had been on her with potty training. She’s just a baby! And yes, she is doing so super awesome at potty training. But she is allowed mistakes and accidents. Celebrating getting back on the potty training wagon after one (of our many) rough periods. My research into the Eight Limbs of Postpartum Yoga was really crucial, I think, it helping me realize my a-ha moment, especially the yamas and niyamas. There is ahimsa, where I continue to cultivate nonviolent actions and thoughts; satya, where I am truthful and realistic about my daughter’s current behavior and development; samtosha, where I am content with her progress (because she has come a really long way from how we started); and definitely tapas, where this potty training business has burned within me compassion and understanding. Now, I am content in knowing that there will be good days and bad days. I have learned so much about her and have discovered that she and I are very similar. And I am trying every day to be a good role model to her. I think that’s the best I can do. Good job to both you and Ms. P! We haven’t started with N yet but I’ll probably tackle it this fall when I’m home on maternity leave, if she hasn’t done it by herself before then. I’m sure she’s “ready,” but I’ve always been the opposite of you. I find it less stressful to deal with the diapers than the accidents! With J we waited until he pretty much did it on his own. He was 3 years, 4 months, but the whole process took about 2 days and he’s been almost completely accident-free ever since (I think he’s had a total of 3-4 accidents at night). Sounds like Ms. P is doing great! 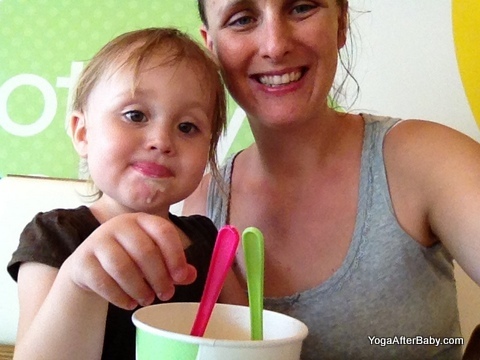 I am potty training #4 at 22 months right now, just blogged about it today, too! Good luck to you, it’s definitely a process, but so rewarding when it’s completed!